H, with puffed sleeves AND long gloves. I still like B best. The long sleeves and tall boots keep her pretty well protected, while the shorter skirt allows for much needed movement. Too much extra fabric in a superhero outfit starts making me think of the scene in the Incredibles where the supers with capes kept coming to bad ends. I kinda think of the Bat Princess as a close combat type (like Batman), and think she'd want less in the way (and less for evil villains to grab & take advantage of in some way). As for the pigtails (hooray for pigtails! 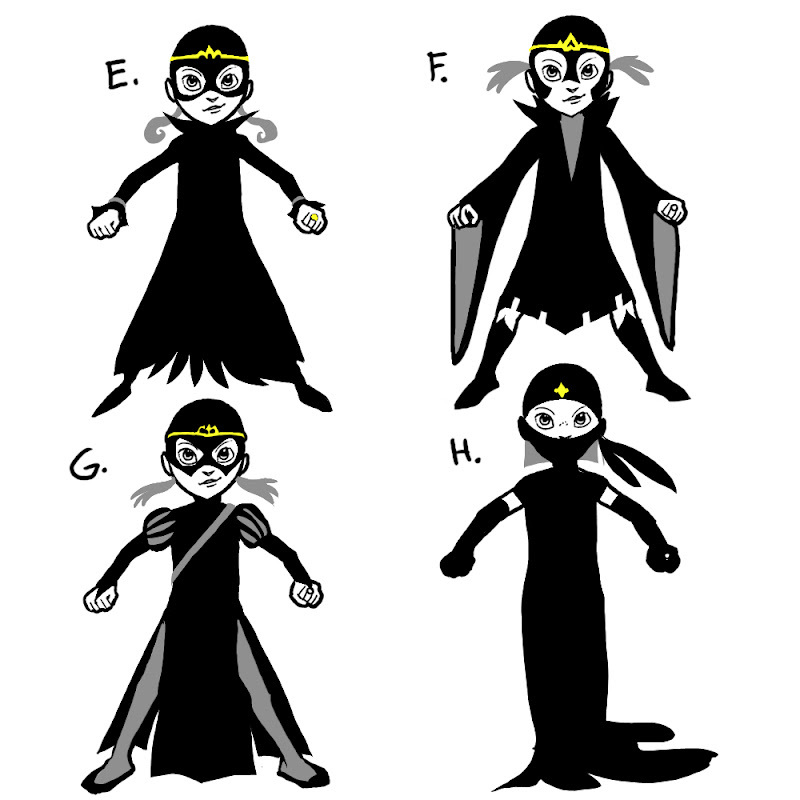 ), I prefer those in A or G. I'm not fond of the mouth-covering mask in H but I could see why you'd want to hide the crown more (though ( love the crowns--a bright spot of yellow in a mostly black/gray outfit is great). I'm loving the boots: B, D, or F. I kinda miss the bat ears on the newer pics. H's dress would limit her mobility. And I just noticed that puff sleeves would probably allow mobility in a way normal sleeves wouldn't––unless this dress is stretchy, in which case it wouldn't matter much. I'm still a fan of the traditional superhero mask––could we incorporate the tiara into that somehow? Have a filigree design along the top of the mask suggesting a tiara? I LOVE G! It seems just about perfect! But doesn't she need a utility belt? I miss the belts/divisions from the A-D group. These ones are all solid black through the waist. i still think she really needs c's skirt made into a cape. I think I like G and H equally best. You can't top a ninja in the awesome department. Especially when the ninja is Princess Batman. F is the best I love the long princess sleeves and the hem line rocks! Maggie likes E best but thinks F is funny "because it's showing her underwear" ? ?